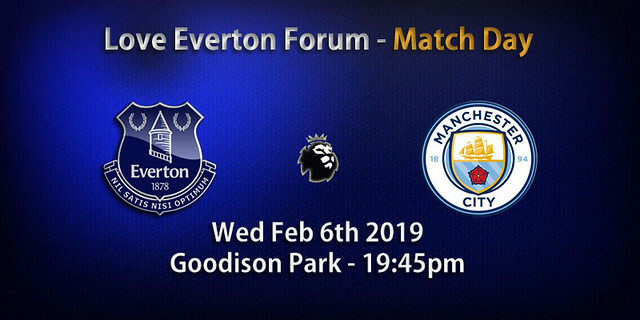 Everton welcome Manchester City to Goodison Park on Wednesday evening looking to return to winning ways after Saturday's defeat to Wolves. As usual, there is plenty of activity going on around the ground before the action begins, across the Fan Zone, Matchday Hub and more. Presented by Guilia Bould, the FanZone is open from 6pm before kicking off at 6.15pm. Wednesday night’s show sees music from Cathy Carter, while former Blues winger Alan Irvine will be interviewed on stage. He will be joined by ex-City midfielder turned pundit Michael Brown. Open from 5pm, the Matchday Hub continues to be the perfect pre-match hot spot for Blues of all ages. In the build-up to the game, the Hub will be offering face painting, crafts sessions, music and a games area. And if that’s not enough, Everton in the Community will deliver three football coaching sessions: Ages 5-7 at 6pm, ages 8-10 at 6.30pm and ages 11+ at 7pm. Food and refreshments available include a children’s meal deal of chicken nuggets or a giant sausage roll with fries and soft drink for just £6 and an adult offering of steak and ale pie, chips, peas and gravy also for £6. Get the name of your favourite Everton player on the back of your shirt. Could it be Richarlison, Andre Gomes or Lucas Digne? Everton One - the Club's megastore opposite Goodison Park - is open before and after the game. Open from 5pm, the EFC Heritage Society will be selling Everton programmes, books, memorabilia and autographed items from players past and present. The popular Teas for Fans will be located in the church hall. It’s the perfect place for Evertonians to chat about all things Blue over a cuppa prior to kick-off. Evertonians can grab a coffee and something to eat before the game in a relaxing atmosphere at the People’s Hub. It will be open from 5pm and offers pre-packed sandwiches, tea, coffee, soft drinks and snacks. Kurt Zouma on the family responsibility which underpinned his motivation to make it as a footballer. Richarlison discussing his soaring ambition and why he’ll play anywhere for Everton manager Marco Silva. Manager Silva writing about the imperative of Everton focusing their minds and preparing meticulously for the visit of Manchester City. And former Everton and City midfielder Gareth Barry revealing why it took until his mid-20s to truly feel comfortable on a football pitch. Everton’s matchday programme for Wednesday's clash with Manchester City is brimming with high-quality, exclusive content. Centre-back Zouma features on a dazzling cover shot, the France international captured under Goodison Park’s evocative floodlights ahead of Everton’s night-time meeting with reigning Premier League champions City. In a far-reaching interview, Zouma opens up about his upbringing in the family apartment back in Lyon with four brothers and parents who, the player reveals, shaped his rounded character. Seriously driven, but scarcely without a smile on his face, Zouma explains how his outgoing personality has propelled him through his professional and personal life at a rate of knots. Brazilian Richarlison reflects on his opening six months at Everton and spells out his determination to become a key man for club and country. Silva’s notes detail the work being undertaken on the USM Finch Farm training fields in a bid to consistently produce performances which exhibit the individual and collective quality in the Blues’ team. Barry, the Premier League’s record appearance maker and a title winner with Manchester City in 2011-12, recalls the anxiety he experienced ahead of his Everton debut and gives away the secret to his remarkable longevity. Paul Simpson, who launched a playing career spanning more than two decades with five years at City during the 1980s, gives us the lowdown on the current team – and provides some insight on a few of the Everton players he managed to Under-20 World Cup glory in 2017. Defender Matty Foulds talks about his return from injury and gives an update from inside the table-topping Everton Under-23 camp. The Club’s Under-18s are flying similarly high and we hear from manager Paul Tait after his team beat Blackburn Rovers 4-0 on Saturday. Willie Kirk, two months into his reign as Everton Ladies boss, identifies how his side can go about competing with the Women’s Super League’s elite teams. And Richarlison turns up again in our regular Spot On feature, the forward tackling a host of subjects; the word's finest-ever footballer, how he'd fare in an Everton Royal Rumble and the meal he would not be without, among them. The Everton matchday programme, priced at £3.50, will be on sale around Goodison Park and at various city centre outlets. Could be extremely embarrassing this one.